By deploying modern CRM tools designed with individual users and individual organizations in mind, organizations ultimately empower users to make more informed business decisions. How? 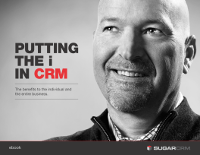 Download “Putting the i into CRM” to find out how Sugar CRM removes the constraints of licensing and silo’d work. Learn how it provides IT with flexible, powerful tools to work with, enabling IT to easily develop the kinds of user experiences and optimized processes that improve employee performance and help ensure competitive advantage.